AirAsia India on Thursday announced it has received the crucial 'No Objection Certificate' from the Civil Aviation Ministry, with the Malaysian parent company's chief Tony Fernandes terming the development as ‘very exciting’. "I am thrilled to announce that Airasia India has received NOC approval from the government of India. “Very exciting and hugely profitable," Fernandes said in a tweet. With the NOC in hand, AirAsia India would now have to apply to the Directorate General of Civil Aviation for its Scheduled Operator's Permit (SOP or the flying permit), which is the final step before it can start its flight operations. flights by examining issues like availability of aircraft, manpower to operate flights as well as on the ground, aircraft parking space at airports and engineering facilities. The NOC would also enable AirAsia India to import the first of the three aircraft to Chennai, which would be its headquarters. AirAsia India, a joint venture between the Malaysian airline AirAsia (which would own 49 per cent stake), the Tatas (30 per cent) and the Telstra Tradeplace owned by Arun Bhatia (21 per cent), plans to start operations within this financial year itself. The start-up airline had been granted security clearances by the Union Home Ministry last month. 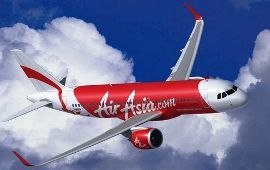 Currently, AirAsia operates in Thailand and Malaysia and connects Chennai, Bangalore, Tiruchirappalli, Kochi and Kolkata in India. Tata Sons have recently announced that they plan to launch another airline in India with Singapore Airlines and have sent their own application to the FIPB for approval. Tatas would own a 51 per cent stake in this venture.